Also referred to as the “Smart Saw”, our Block Pallet Prep Smart Saws and GMA or Stringer Pallet Prep Smart Saws are multi-functional and designed for repair or recycling operations. The Smart Saw is designed to QUICKLY cut out damaged boards, including bottom deck boards, top lead and other deck boards, as well as middle and outside boards. The Smart Saw is designed to process the disassembly of pallets for INCREASED BLOCK AND LUMBER RECOVERY. 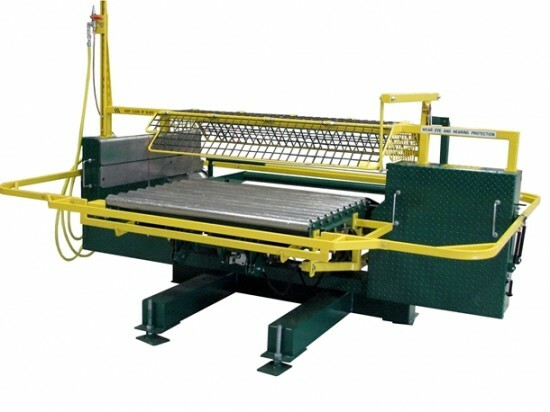 Our pallet prep machinery is able to salvage lumber that is scrapped with other machines and processes. Our Pallet Prep Smart Saw can be easily integrated into a full line block pallet repair system. For more information about our Pallet Prep Smart Saws, click on the pictures above to find additional information, specs, and videos demonstrating our pallet recycling and repair equipment in action.